My family had dinner at my friend Anthony's place on Saturday evening. We had some great pizza and Corona's. Both of our kids got along right away like they had known each other for a long time. Sabrina and Maria are 8 years old, Hannah is 5, and Mason is 4. 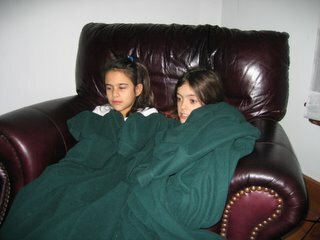 Here you see sleepy Sabrina cozzying up with Maria while watching a movie. I believe they were watching the Polar Express. Aren't they cute?